OpenBOM, a cloud-based Bill of Materials and Part Catalog management tool announces availability of OpenBOM for Fusion 360 on Autodesk Fusion 360 App Store further dramatically improves the user experience for Fusion 360 customers. “With this announcement, OpenBOM provides the Autodesk Fusion 360 community an easy and delightful cloud based inherently collaborative way to manage their BOMs. You will love it!” said Jim Quanci, Senior Director Autodesk Forge. OpenBOM, the first real-time collaborative Bill of Materials and Part Catalog Management system for engineering, manufacturing, and supply chain, integrated and able to extract Bills of Materials from CAD systems now is available directly from Autodesk Fusion 360 App Store. By doing so, OpenBOM offers Autodesk Fusion 360 users a direct way to install and activate the OpenBOM application. The Autodesk Fusion 360 App Store allows users to download installation packages for both Windows and MacOS versions and register an OpenBOM cloud subscription account. This method eliminates the need for multiple installations and configurations of OpenBOM for Fusion 360 and provides a dramatic improvement in the overall user experience and customer support. Allow the Fusion 360 user to calculate cost(s) and manage rollup for Bill of Materials. Brings advanced collaboration across teams and organizations to the desktop CAD system using advanced cloud technology. Autodesk’s vision and strategy of cloud technologies is well aligned with OpenBOM's native cloud BOM and Part Catalog management tools providing sharing and collaboration between engineers, production planners, contractors, customers and the extended enterprise. 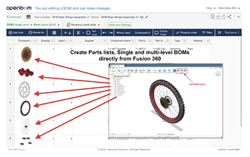 “Offering OpenBOM on the Autodesk Fusion 360 app store further expands OpenBOM's existing CAD integrations and dramatically improves the user experience for Fusion 360 customers working with BOMs,” said Oleg Shilovitsky, CEO and Co-founder of OpenBOM. “With this announcement, OpenBOM provides the Autodesk Fusion 360 community an easy and delightful cloud based inherently collaborative way to manage their BOMs. You will love it!” said Jim Quanci, Senior Director Autodesk Forge. OpenBOM develops modern cloud-based real-time collaboration and data management technology to manage BOM, Part Catalogs and related product information across networks of engineers, supply chain managers, and contract manufacturers. OpenBOM enables people to share and collaborate using online Bill of Materials from initial design through all stages of engineering, manufacturing, and supply chain. Headquartered in the Boston, MA area, OpenBOM’s website is at http://www.openbom.com. Learn more how OpenBOM is the new alternative to BOM spreadsheets. For more information or questions please contact oleg(at)OpenBOM(dot)com. OpenBOM is a wholly owned and branded product of Newman Cloud, Inc.